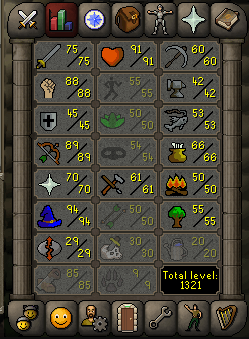 OSRS Max Melee staker 115 Combat level. 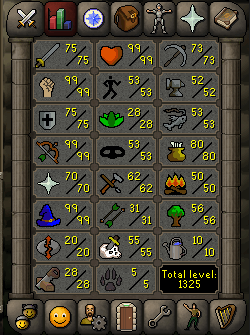 OSRS Account 114 CB 229 Qp alot untradeables..
OSRS MAX zerker account fully quested PK ready. OSRS Max AGS pure, quested fire cape! 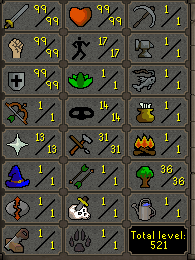 Are you looking to buy an OSRS account with guaranteed safety? At WalsuGold we have a lot of experience when it comes to providing Runescape gold, services, and accounts to our customers. We consider safety and security as priority number one, and therefore we can guarantee a safe and secure process when you're buying an Old School Runescape account from us. Throughout the years we've gained a lot of experience and knowledge, so we can make sure you won't have any issues when buying from us. All of the accounts that we have for sale are hand-trained by trusted workers at WalsuGold, if this is not the case, the origin of the account is from a well-known and trusted source so you don't have to worry about someone trying to recover the account. You don't get this level of security and safety at other sources, because there are a lot of people trying to scam their customers by selling them accounts and recovering them months later so they can resell it. Fortunately, we at WalsuGold want to provide a safe platform for not only account selling, but also gold selling, and other Runescape services, so you won't have to search on the internet and waste your time looking for other trusted vendors. In order to be able to guarantee our customers a safe and secure process, not only when you buy the account but also months or even years after purchasing an account from us, we verify all accounts we have for sale and inspect them thoroughly to make sure they're safe and secure so you won't face any issues. All the accounts that we have for sale went through this process. We create and hand-train some of the accounts ourselves but we also resell. We only resell from well-known and trusted sources so you don't have to worry about anything happening to your account. In our history of account selling, we've never experienced a customer losing their account because of the lack of safety or security coming from our side. When we buy an account that we're going to sell, we require personal details from the seller such as ID verification, phone number, and home address, so we don't have to worry about anything happening to the account. Why should you buy an Old School Runescape account? It's a known fact that Runescape is a game that consists of constant grinding, and in order to reach some decent stats you'll have to put in a lot of time and grind on daily basis. A lot of people dislike this part of the game and want to go straight to the fun part and rather skip the endless hours of grinding, many people can't afford to put so much time in a game. When you buy an account from us, you can save weeks or even months of daily grinding for a fair and reasonable price. 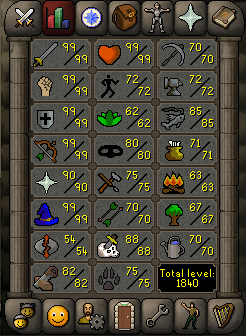 Because who wants to spend hours and hours, every single day, for months just to get one skill up to 99? Not a lot of people, and that's why we do it for you so you don't have to bother spending so much time while you could be playing the more fun parts of the game. When buying from us, you don't have to worry about the account getting recovered. The whole process is safe, secure, and discrete, which is how it's supposed to be. 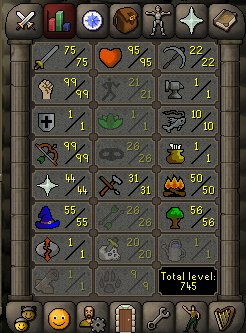 How does buying an Old School Runescape account work? You can simply order an account from the account page or contact our workers using the live-chat. When you've contacted us we'll set up a payment plan, currently, we have two payment plans. You can pay 80% of the account price and you'll get access to the account so you can play on it, then you have one month to pay the remaining 20% of the account price. When you've paid the whole account price after one month (or earlier), you'll get full access to the account, you'll get the recovery questions, email address change, simply all the information you need to have the full ownership over the account. You can also choose to pay 100%. When you choose for this payment plan you'll get all of the account information immediately after your payment. If you don't understand how to set-up the account you buy, don't worry, our workers will always guide you through the process so your account is safe and make sure you have 100% control and ownership over the account. You can always contact our workers by using the livechat for more information regarding payment plants. Why should you buy an account from WalsuGold and not elsewhere? At WalsuGold we can guarantee you a safe, secure and discrete process when buying from us. When you've bought an account from us, you don't have to worry about the account being recovered. This is because we verify all accounts that we have for sale, so we can be sure that our customers won't face any issues. All of the accounts that we have for sale come from very trusted sources or are trained by WalsuGold workers, because of this we can guarantee that you won't lose your account because of flaws coming from our side. We have professional and very trustworthy workers at WalsuGold that'll make sure you get a problem-free, easy, and fast buying process, they'll always support and guide you during the process so there won't be any problems. At WalsuGold we've been in the Runescape market business for a long time, we don't have just experience with account selling, but also account renting, gold selling, and other services. Throughout our time of providing Runescape services, we've established a well known and trusted name. When you're buying from us, you know that you're safe and have guaranteed security and discreteness, not only during the buying process but also months after. While offering the best services with the highest quality, we're also offering the fairest and most reasonable prices.